Erich Maria Remarque (born Erich Paul Remark; 22 June 1898 – 25 September 1970) was a German novelist who created many works about the horrors of war. His best known novel All Quiet on the Western Front (1928), about German soldiers in the First World War, was made into an Oscar-winning film. His book made him an enemy of the Nazis, who burned many of his works. Erich Maria Remarque was born on 22 June 1898 into a working class Roman Catholic family in the German city of Osnabrück to Peter Franz Remark (b. 14 June 1867, Kaiserswerth) and Anna Maria (née Stallknecht; born 21 November 1871, Katernberg). Research by Remarque's childhood and lifelong friend Hanns-Gerd Rabe proved that in fact Remarque had French ancestors—his great-grandfather Johann Adam Remarque, who was born in 1789, came from a French family in Aachen. During World War I, Remarque was conscripted into the German Army at the age of 18. On 12 June 1917, he was transferred to the Western Front, 2nd Company, Reserves, Field Depot of the 2nd Guards Reserve Division at Hem-Lenglet. On 26 June, he was posted to the 15th Reserve Infantry Regiment, 2nd Company, Engineer Platoon Bethe, and was stationed between Torhout and Houthulst. On 31 July, he was wounded by shrapnel in the left leg, right arm and neck, and was repatriated to an army hospital in Germany where he spent the rest of the war. After the war he continued his teacher training and worked from 1 August 1919 as a primary school teacher in Lohne, at that time in the county of Lingen, now in the county of Bentheim. From May 1920 he worked in Klein Berssen in the former County of Hümmling, now Emsland, and from August 1920 in Nahne, which has been a part of Osnabrück since 1972. On 20 November 1920 he applied for leave of absence from teaching. Remarque worked at a number of different jobs, including librarian, businessman, journalist, and editor. His first paid writing job was as a technical writer for the Continental Rubber Company, a German tire manufacturer. At the age of 16, Remarque had made his first attempts at writing; this included essays, poems, and the beginnings of a novel that was finished later and published in 1920 as The Dream Room (Die Traumbude). When he published All Quiet on the Western Front, Remarque changed his middle name in memory of his mother and reverted to the earlier spelling of the family name to dissociate himself from his novel Die Traumbude. The original family name, Remarque, had been changed to Remark by his grandfather in the 19th century. In 1927, Remarque made a second literary start with the novel Station at the Horizon (Station am Horizont), which was serialised in the sports journal Sport im Bild for which Remarque was working. It was published in book form only in 1998. 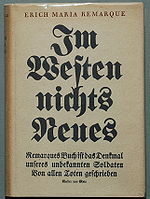 All Quiet on the Western Front (Im Westen nichts Neues) was written in 1927, but Remarque was not immediately able to find a publisher. The novel, published in 1929, described the experiences of German soldiers during World War I. A number of similar works followed; in simple, emotive language they described wartime and the postwar years. In 1931, after finishing The Road Back (Der Weg zurück), Remarque bought a villa in Porto Ronco, Switzerland, planning to live both there and in France. His next novel, Three Comrades (Drei Kameraden), spans the years of the Weimar Republic, from the hyperinflation of 1923 to the end of the decade. Remarque's fourth novel, Flotsam (in German titled Liebe deinen Nächsten, or Love Thy Neighbour), first appeared in a serial version in English translation in Collier's magazine in 1939, and Remarque spent another year revising the text for its book publication in 1941, both in English and German. His next novel, Arch of Triumph, first published in 1945 in English, and the next year in German as Arc de Triomphe, was another instant best-seller and reached worldwide sales of nearly five million. His last novel was Shadows in Paradise; he wrote it while living at 320 East 57th Street in New York City. The apartment building "played a prominent role in his novel". On 10 May 1933, the German government, on the initiative of the Nazi propaganda minister, Joseph Goebbels, banned and publicly burned Remarque's works. He finally left Germany to live at his villa in Switzerland. Remarque's German background as well as his Catholic faith were questioned by the Nazis, who continued to decry his writings, arguing anyone who would change the spelling of his name from the German "Remark" to the French "Remarque" could not be a true German. The Nazis further made the false claim that Remarque had not seen active service during World War I. In 1938, Remarque's German citizenship was revoked; and then in 1939, after he and his ex-wife were remarried to prevent her repatriation to Germany, they left Porto Ronco, Switzerland, for the United States. They became naturalised citizens of the United States in 1947. In 1943, the government arrested his youngest sister, Elfriede Scholz, who had stayed behind in Germany with her husband and two children. After a trial in the "Volksgerichtshof" (Hitler's extra-constitutional "People's Court"), she was found guilty of "undermining morale" for stating that she considered the war lost. Court President Roland Freisler declared, "Ihr Bruder ist uns leider entwischt—Sie aber werden uns nicht entwischen" ("Your brother is unfortunately beyond our reach—you, however, will not escape us"). Scholz was beheaded on 16 December 1943. In exile Remarque was unaware of his relatives' fate until after the war, and would dedicate his 1952 novel Spark of Life (Der Funke Leben) to Scholz, but the dedication was omitted in the German version of the book, reportedly because he was still seen as a traitor by some Germans. In 1948, Remarque returned to Switzerland, where he spent the rest of his life. There was a gap of seven years—a long silence for Remarque—between Arch of Triumph and his next work, Spark of Life (Der Funke Leben), which appeared both in German and in English in 1952. While he was writing The Spark of Life Remarque was also working on a novel, Zeit zu leben und Zeit zu sterben (Time to Live and Time to Die). It was published first in English translation in 1954 with the not-quite-literal title A Time to Love and a Time to Die. In 1958, Douglas Sirk directed the film A Time to Love and a Time to Die in Germany, based on Remarque's novel. Remarque made a cameo appearance in the film in the role of the Professor. In 1955, Remarque wrote the screenplay for an Austrian film, The Last Act (Der letzte Akt), about Hitler's final days in the bunker of the Reich Chancellery in Berlin, which was based on the book Ten Days to Die (1950) by Michael Musmanno. In 1956, Remarque wrote a drama for the stage, Full Circle (Die letzte Station), which played in both Germany and on Broadway. An English translation was published in 1974. Heaven Has No Favorites was serialised (as Borrowed Life) in 1959 before appearing as a book in 1961 and was made into the 1977 film Bobby Deerfield. The Night in Lisbon (Die Nacht von Lissabon), published in 1962, is the last work Remarque finished. The novel sold some 900,000 copies in Germany. His first marriage was to the actress Ilse Jutta Zambona in 1925. The marriage was stormy and unfaithful on both sides. Remarque and Zambona divorced in 1930, but in 1933 they fled together to Switzerland. In 1938 they remarried, to prevent her from being forced to return to Germany, and in 1939 they immigrated to the United States where they both became naturalised citizens in 1947. They divorced again on 20 May 1957, this time for good. Ilse Remarque died on 25 June 1975. During the 1930s, Remarque had relationships with Austrian actress Hedy Lamarr, Dolores del Río and Marlene Dietrich. The affair with Dietrich began in September 1937 when they met on the Lido while in Venice for the film festival and continued until at least 1940, maintained mostly by way of letters, cables and telephone calls. A selection of their letters were published in 2003 in the book "Sag Mir, Dass Du Mich Liebst" ("Tell Me That You Love Me") and then in the 2011 play Puma. Remarque married actress Paulette Goddard in 1958 and they remained married until his death of heart collapse that had been brought on by an aneurysm in Locarno on 25 September 1970, aged 72. Remarque was interred in the Ronco Cemetery in Ronco, Ticino, Switzerland. Goddard died in 1990 and was interred next to her husband. She left a bequest of US$20 million to New York University to fund an institute for European studies, which is named in honour of Remarque. The first Director of The Remarque Institute was Professor Tony Judt. Remarque's papers are housed at NYU's Fales Library. In November 2010, efforts to raise CHF6.2M (US$7M), to buy and save the villa of Erich Maria Remarque and Paulette Goddard from almost certain demolition were underway. The intent was to transform the Casa Monte Tabor into a museum and home to an artist-in-residence programme. Note: the dates of English publications are those of the first publications in book form. Im Westen nichts Neues, 1929 original version. ^ a b Robertson, William. "Erich Remarque". Retrieved 25 June 2009. ^ Landová, Jolana: Exil, Krieg und Flucht in Frankreich zwischen 1933 und 1941, dargestellt an ausgewählten Werken deutscher Schriftsteller, Charles University in Prague, 2009, p. 46. ^ "Exactly as it happened... (the story of an encounter in Ticino with Remarque and the coach-built Lancia Dilambda, which following All Quiet on the Western Front, he purchased in 1931 and retained till the late 1960s)". Motor. Vol. 3506. 30 August 1969. pp. 26–30. ^ Afterword by Brian Murdoch, translator of 1996 English edition of All Quiet on the Western Front. London: Vintage Books. 1996. p. 201. ISBN 978-0-09-953281-1. ^ Ullmann, Michaela. "Research Guides: Exiled German-speaking intellectuals in Southern California: Erich Maria Remarque". libguides.usc.edu. ^ "Finding Aid for Erich Maria Remarque Papers, 1938–1973", Department of Special Collections and Archives, State University of New York-Albany. 2009; accessed 31 July 2012. ^ Schneider, Thomas (1991). Erich Maria Remarque: Ein Chronist des 20. Jahrhunderts, Eine Biographie in Bildern und Dokumenten. Germany: Rasch Verlag Bramsche. pp. 94–95. ^ "Elfriede Scholz Obituary" (in German). Osnabrück Cultural Website. 15 December 2005. Archived from the original on 24 September 2009. Retrieved 25 June 2009. ^ Sauer, Patrick (16 June 2015). "The Most Loved and Hated Novel About World War I". Smithsonian.com. Smithsonian Institution. Retrieved 21 June 2015. ^ Liukkonen, Petri. "Erich Maria Remarque". Books and Writers. Finland: Kuusankoski Public Library. Archived from the original on 1 August 2008. ^ Taylor, Marvin J. The life and writings of Erich Maria Remarque, New York: Fales Library, New York University, 2011; accessed 29 July 2012. ^ Bloom, Harold (2001). "Chronology". Modern Critical Interpretations: Erich Maria Remarque's All Quiet on the Western Front. Philadelphia: Chelsea House Publishers. p. 157. ^ Latins in Hollywood: Dolores del Río, latinasdeayer.blogspot.mx; accessed 24 August 2017. ^ Connolly, Kate. "Marlene and the wall", The Guardian, 18 April 2002. ^ Fuld, Werner & Thomas F. Schneider (eds). "Dass Du Mich Liebst: Erich Maria Remarque — Marlene Dietrich Zeugnisse einer Leidenschaft ("Tell Me That You Love Me: Erich Maria Remarque-Marlene Dietrich. Evidence of a Passion). Koln: Kiepenheuer & Witsch, 2003. ^ Germany, SPIEGEL ONLINE, Hamburg. "Marlene Dietrich und Remarque: "Madonna meines Blutes" - SPIEGEL ONLINE — Kultur". SPIEGEL ONLINE. ^ Jones, Kenneth. "Marlene Dietrich is Focus of Puma, a NJ Rep World Premiere Starting Feb. 24." Archived 24 February 2013 at the Wayback Machine, Playbill.com, 24 February 2011; accessed 29 July 2012. ^ Lorch, Donatella. "Paulette Goddard Left N.Y.U. $20 Million", New York Times, 18 May 1990; accessed 29 July 2012. ^ "About Us", Remarque Institute. New York University; accessed 29 July 2012. ^ Taylor, Marvin J. "Introduction", The life and writings of Erich Maria Remarque. New York: Fales Library, New York University, 2011; accessed 29 July 2012. ^ swissinfo.ch, Gerhard Lob,. "Remarque-Villa im Tessin droht der Abbruch". Parvanová, Mariana (2010). "... das Symbol der Ewigkeit ist der Kreis". Eine Untersuchung der Motive in den Romanen von Erich Maria Remarque (in German). München: GRIN-Verlag. ISBN 978-3-640-64739-2. Parvanová, Mariana (2009). E. M. Remarque in der kommunistischen Literaturkritik in der Sowjetunion und in Bulgarien (in German). Remscheid: ReDiRoma Verlag. ISBN 978-3-86870-056-5. Wikimedia Commons has media related to Erich Maria Remarque. This page was last edited on 16 April 2019, at 18:54 (UTC).